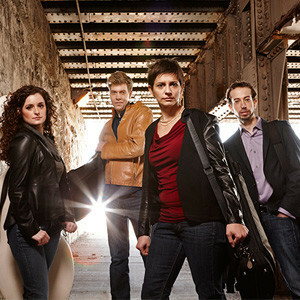 Ariel Quartet Performs in NYPhil's Inaugural "Nightcap" Series | Kirshbaum Associates Inc. The highly-acclaimed, young Ariel Quartet returns to New York City in the fall of 2018 with two captivating performances: as a part of the New York Philharmonic Orchestra’s Nightcap series, as well as the Aspect Foundation for Music & Arts series, based at The Italian Academy of Columbia University. On October 13, the ensemble performs a late-night concert in the Stanley Kaplan Penthouse at Lincoln Center, in a program curated by Louis Andriessen as part of the Philharmonic’s The Art of Andriessen, which journeys through Ravel, Miles Davis, and John Cage, highlighting the ways in which their work helped shape Andriessen’s unique, innovative musical voice. The program is preceded by a Philharmonic concert which features Andriessen’s TAO. The Marie-Joseé Kravis Creative Partner Nadia Sirota hosts. The Quartet made their debut with Aspect Foundation for Music & Arts last season, in a performance exploring Tolstoy’s influence in music, about which The Strad remarked of their Tchaikovsky: “The novelist would have been brought to tears by the Ariel Quartet’s sensitive, even-handed reading, laced with a soupçon of sentiment.” At this performance, the Quartet members will also give an “Illustrated Talk” about the all-Beethoven program, which juxtaposes and contextualizes one of his earliest and latest string quartets. The Ariel Quartet recently received the prestigious Cleveland Quartet Award, granted by Chamber Music America in recognition of artistic achievement and career support. The ensemble serves as the Faculty Quartet-in-Residence at the University of Cincinnati’s College-Conservatory of Music, where they direct the chamber-music program and present a concert series, in addition to maintaining a busy touring schedule in the United States and abroad. This summer, the Quartet made their Mostly Mozart debut with pianist Inon Barnatan and bassist Timothy Cobb in The Trout with the Mark Morris Dance Group. Following appearances at leading festivals in the United States, Canada, and Italy, the Ariel Quartet begins the 2018-2019 season at the Newport Music Festival, followed by Music Mountain in Lakeville, CT, where they are joined by clarinetist Oskar Espina Ruiz for an all-Mozart program. Additional fall engagements include programs in New York and Washington, DC, and concerts with Calgary Pro Musica, where the Ariel Quartet gives the Canadian premiere of John Harbison’s String Quartet No. 6. In November, the quartet embarks on a European tour, with dates in Basel, Paris, and Berlin. Highlights of 2019 are performances at the University of California, San Diego, and Mannes School of Music in New York. The Ariel Quartet is presented by Music Toronto and Chamber Music Society of Utica, where they are joined by pianist Orion Weiss for the Schumann Piano Quartet and the Brahms Piano Quintet. At the Linton Chamber Music Series in Cincinnati, the Ariel gives the U.S. premiere of the Quintet for Piano and Strings by Daniil Trifonov, with the composer as pianist.